Is this the future of education? What digital learning looks like when third-graders use it all day in one suburban district. 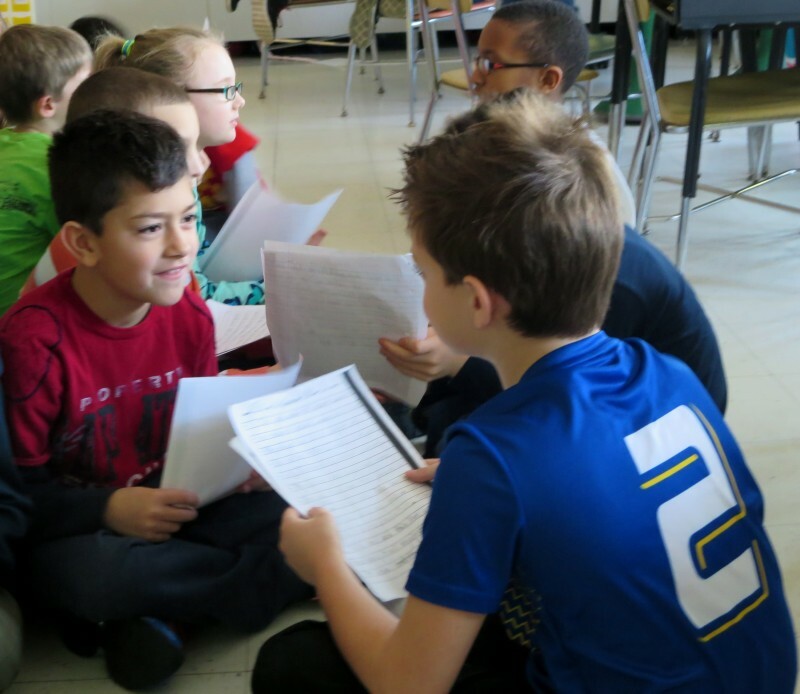 MINEOLA, N.Y. — When the 24 third-graders in Morgan Mercaldi’s class arrive at the Jackson Avenue School every morning, they take their iPads out of their backpacks and put them on their desks. The tablets will remain there, or in hands and laps, until the children put them in their packs to take them home. Last year Mercaldi had her students stash the iPads away when they weren’t using them. But she has abandoned that. “Putting them away serves no purpose. We use them constantly,” Mercaldi says. 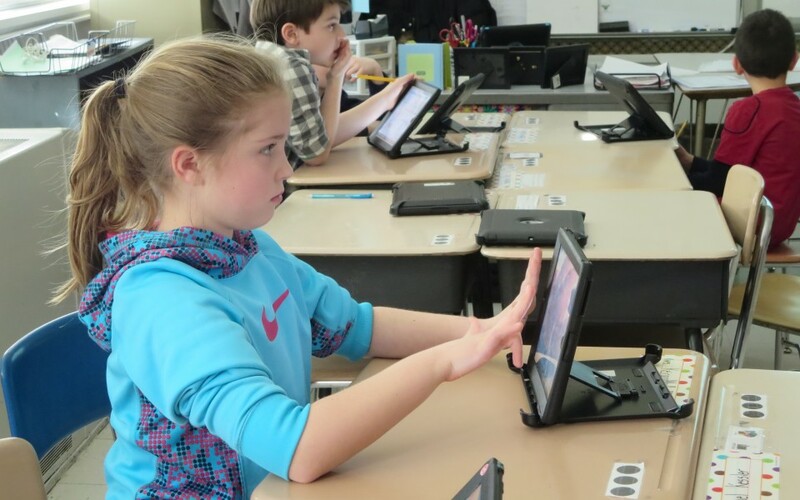 Mercaldi’s class in Mineola, N.Y., is in the fifth year of a district initiative that now provides iPads to all students in grades three through nine. 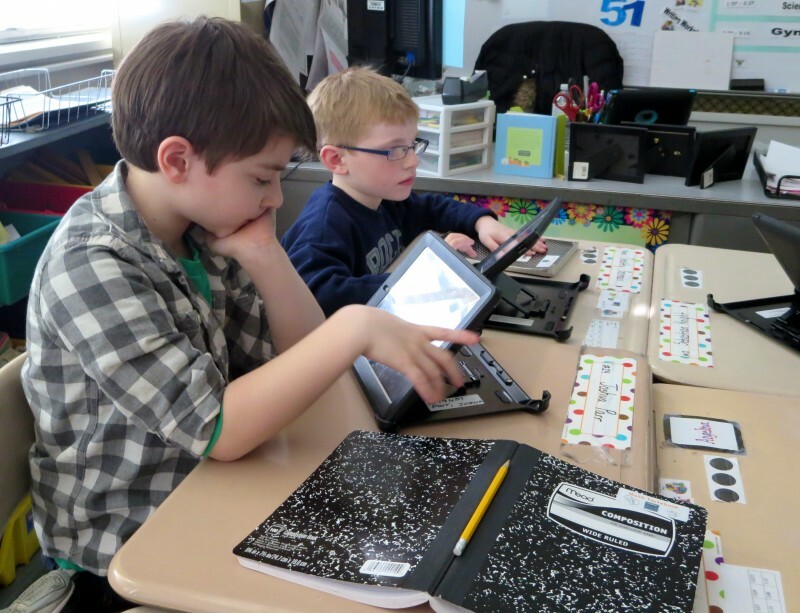 At Jackson Avenue, which houses the third and fourth grades, all 417 children, including those in special education, have their own tablets, and they spend about 75 percent of their instructional day on the devices, more than many other schools that have embraced digital learning. 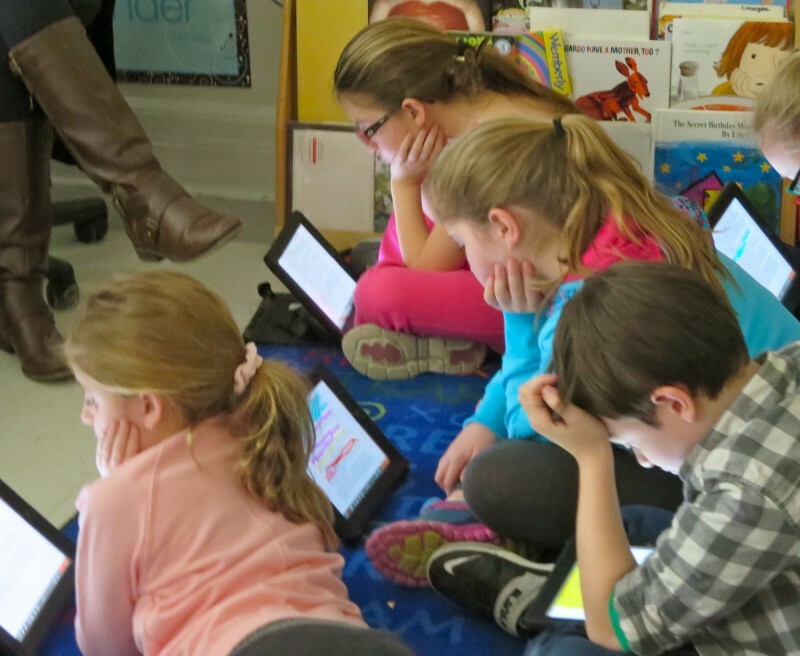 Despite a lack of hard data on how digital learning affects student achievement, Mineola, a fairly affluent New York City suburb, is betting heavily on technology to help children meet an array of tough Common Core standards. 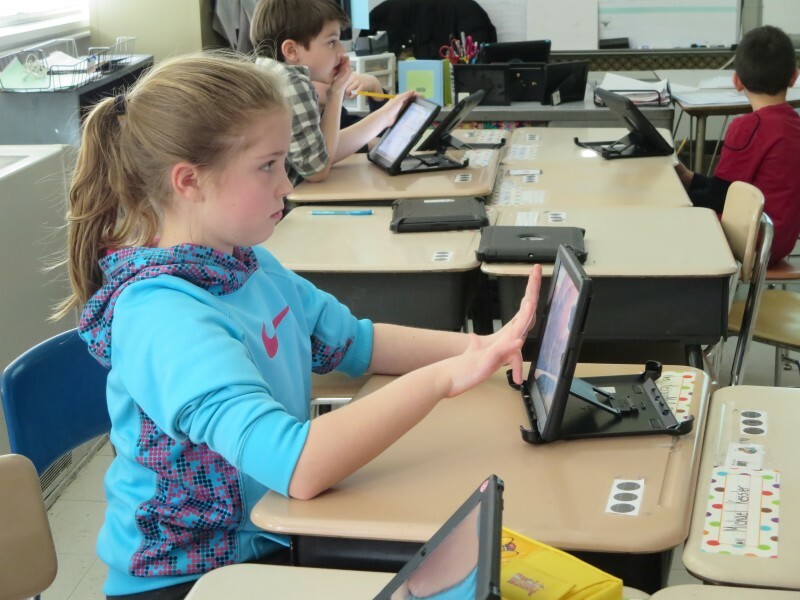 By embracing iPads while keeping the traditional model of one teacher working with 20-some children, the small school district offers a vision of what the future of digital learning might be. Here’s a typical day in a third-grade classroom. At around 10 a.m. on a late-winter day, Mercaldi’s students sit scattered around the sunny classroom, some at their desks, some perched on a shelf running along one wall and some on the bright blue rug. All the children have their iPads out as they read and do English language arts exercises. Many use eSpark, which creates a “playlist” of education apps geared to each student’s needs. After about 25 minutes, Mercaldi calls the students together to revise the first-person pieces about frogs that they each researched and wrote. Like so much in the class, the assignment has had digital and paper elements. Mercaldi’s students received their iPads in October, and now move smoothly from pencil to touch screen and from paper to tablet. The children did their frog research both online and in books, organized the materials on their iPads, and did their writing on paper. At 10:45 a.m., after a short snack break, the students take out their iPads for the first of several math lessons that Mercaldi will sprinkle throughout the day. Today, the main topic is finding the area of rectangles and the multiplication needed to do that. 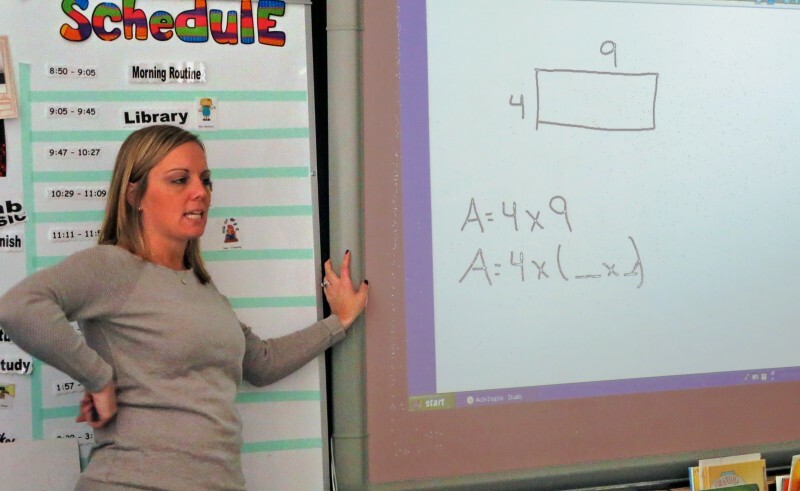 As Mercaldi stands at a large interactive whiteboard, the children follow along on their tablets, trying to figure out the area of a 7-by-13 rectangle. “Do we know 7 times 13 just like that?” she asks the students. Most agree they do not, and so break the number down, eventually coming up with 3 times 7 plus 10 times 7. Staying with math, the students then use their iPads to answer questions Mercaldi has posted on Edmodo, which helps students and teachers communicate electronically and lets Mercaldi see the children’s answers. (Last year Mercaldi used regular email and was bombarded with messages. 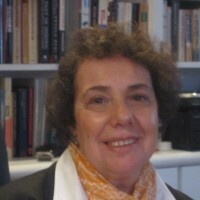 She finds Edmodo “more efficient … a little more teacher-student.”) Reviewing the students’ work, Mercaldi says, lets her assess whether every child is meeting the standards and, if not, where he or she needs help. Now in her second year with the iPads and her seventh year as a teacher, Mercaldi seems unfazed by the technology. “I kind of grew up with technology. It’s the future,” she says. Most children also seem comfortable with the devices. “I have one at home but I was excited to get it at school because I thought it would be an interesting experience,” Brianna DiVirgilio says. 11:20 a.m. – 12:55 p.m. When students finish their math questions, they can move on — to reading on eSpark, working on an app or watching a video. Then, at around 11:20, the class divides again, this time into four groups, each designated by a color. The group assignments are geared to the students’ individual levels and what they need to know. One group reads with Mercaldi. The other three do lessons on their iPads: one on eSpark, one answering language arts questions on Edmodo and the third on MobyMax, a provider of electronic curricula. The students seem to like MobyMax the best because it begins every day’s task with a joke. While the technology may be new, the gags aren’t (“What has four wheels and flies?”). The children also like the badges — usually a nature photograph — that they get when they answer a set of questions correctly. At Mercaldi’s prompting, three girls explain how they made videos about the imaginary organizations all the students created: Clothes Court, Rockin’ Socks and Shoes and Books for Reading. The videos are accessible by scanning a QR code with a mobile device. By 11:40 it’s time for the second of the day’s math lessons, a drill — Mercaldi calls it a “sprint” — in which the students use paper and pencils to rapidly solve a series of problems, this time involving number patterns. After that, they will break for lunch. Shortly before 1 p.m., the children return from lunch for another math lesson and open their paper workbooks to exercises on finding the area of a rectangle. At Mercaldi’s urging, the students offer various strategies for the same problem. “Use what works,” she says. After several students depart for music class, those left behind alternate between iPads and paper to solve problems about rectangles and the properties of multiplication. The tablet has one advantage with the children. “They’re engaged and they like it; it doesn’t seem like a job,” Mercaldi says. But the device also can be too much of a good thing. “It can’t consume their every day,” she says, adding, “The hardest thing was finding the balance.” In general, she tries to take the students off an app after 20 minutes. With several hours during the school day on the iPads, plus homework time and other afterschool use, it’s not hard to imagine that some Jackson Avenue students may look at their tablets for six hours or more a day. The day’s math lessons end with a problem set, to be done on the iPads. Most students come to the rug to work on the questions with Mercaldi and the other children. A few, though, go it alone. Mercaldi tells the children to list all possible rectangles with an area of 48 square centimeters and to consider what the various shapes might look like. “When the numbers are closer, don’t they kind of look like squares?” Brianna proposes. While some parents may have had qualms about giving young children access to the web, Gonzalez says there have been surprisingly few difficulties. The students clearly know the situation: “If you do stuff that’s bad on it, you can have it taken away,” they say. The day’s final lesson has the children gathered on or around the rug with their iPads for a science class on climate and seasons. Mineola is in the midst of a severe cold spell, and the students chatter with the teacher about this. As that dies out, Mercaldi takes up a reading that is posted on the whiteboard, and the children follow along on their tablets. The text has lots of information and complicated vocabulary, so Mercaldi offers tips. “I would definitely use highlighter to mark something interesting or something you learned,” she advises. Once they have completed reading the passage, Mercaldi challenges the children to write down something interesting from the reading and to post on Edmodo a picture of the climate zone where they would like to live. She advises anyone who’s not certain of the assignment to take a picture of the whiteboard. “Can I send you back to your seats? Can you do this without talking? Then you’ll earn three marbles,” she tells them. Students can cash in the marbles for purchases at a classroom store or for a class prize (the children have chosen unstructured tablet time). The posting of the pictures is a bit slow, and they overlap one another when Mercaldi tries to put them on the whiteboard. She pledges to return to the project the next day. Now it is 2:40, and the children pack up their iPads. It’s time for a hockey game in the gym, and, for now at least, there is no app for that.